I found the following blog post via twitter. I 110% agree with this post. I am a firm believer in harnessing the imagination and determination of those will to try. How can companies get the best possible performance out of their employees? Let them do whatever they want! And furthermore, don't offer incentives. Sound counter-intuitive? Not if you look at what research has shown regarding the economics of motivation. "There is a disconnect between what science knows and what business does." "Traditional notions of management work great if you want compliance, but if you want engagement, self-direction works best." So does this mean we should cut back on bonuses and perks for good performance? Well, maybe. In tasks that involve focused, clear objectives and goals, incentives do work. However, in tasks that involve creativity, innovation, and generating original ideas, offering incentives actually distracts from the mind's ability to freely think outside of the box and be open to creative insights. 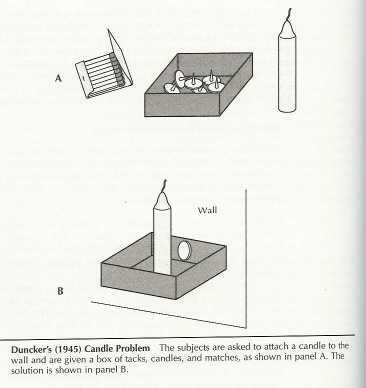 In Duncker's famous "candle problem" illustrating Functional Fixedness (1945), subjects are asked to attach a candle to wall in a way to prevent wax from dripping on the table- given only a candle, a book of matches, and a box of tacks. Some subjects tried to tack the candle to the wall, others tried to melt the wax on the side of the candle to stick it to the wall. Neither of these worked. The solution is shown here. The whole idea of this experiment was to show the importance of using creativity problem-solving to come up with functional solutions. Sam Glucksberg, from Princeton University, decided to test if offering a financial reward helped people to perform better at this task. He found that when a financial incentive was offered for completing the task in a shorter amount of time, they actually, on average, took longer to solve the problem than the group that was offered no financial incentive. Why is this? When we are offered a reward for a behavior, part of our brain is focused on that reward, which is how incentives work. However, if we are doing a task that requires creativity, narrow focus limits the range of necessary flexibility of thought that is essential to creative output. When we are given no incentive and thus free to completely devote our mental efforts to just solving the problem, our mind is able to generate these creative solutions faster. Pink talks of companies such as Google and Atlassian who have pre-set "free work times"; during these times, employees have no restrictions on what they can work on, what time they have to be in the office, even whether or not they have be in the office at all to do their work. The only stipulation is that they have to get "something" done. It is these times, where they are basically free to work on whatever they want, that end up generating up to half of the total successful innovative developments for the company. Because the employees did not have to focus on anything like specs or any particular ideology, they were driven only by their own intrinsic motivation to work, thinking for the pure enjoyment of generating new ideas. Autonomy, it seems, is the new form of management when it comes to creative output. In an age where computers are taking over computational tasks and more of the focused directional work, we rely heavily on the human capacity to be creative. Creativity has become vitally important for the advancement of society and the continuation of forward progress; development of new technologies, innovations, and even scientific theories are driven by creative ideation. If we want engineers, scientists, or any type of worker to be able to function at their absolute creative best, allowing them to freely explore their ideas without having to worry about restrictive subject matter, methods, or ideology is the best way to reach that goal.